OUR CHILD OF THE STARS. On sale hardback, e-book, and audiobook. Links here. 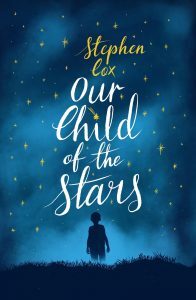 Our Child of the Stars has received rave reviews in the Guardian, Grazia, Daily Mail, My Weekly, Mature Times and Candis, and in the SF media in Interzone and SciFiNow. The best way to get important updates is to sign up to my email newsletter. I’ll only send you stuff when there’s something interesting to say – no spam and unsubscribe any time.